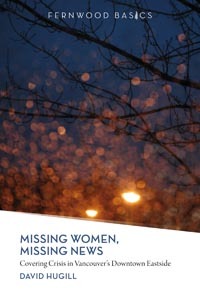 Last week, I caught a fascinating presentation at the University of Manitoba by David Hugill about his new book, Missing Women, Missing News: Covering Crisis in Vancouver’s Downtown Eastside. At his U of M presentation, Hugill said the news media failed to tell the full story in two major ways: one, by over-emphasizing the gritty, tragic dimensions of each victim’s individual life-story, and two, by focusing almost exclusively on the role of police in accounting for these women’s deaths, thereby ignoring the potential role and responsibility of other government bodies. To Hugill, both media ‘narratives’ (private tragedy and police incompetence) “hold particular individuals and practices accountable but largely omit, conceal, or erase the broader socio‐political context that renders those practices possible.” In other words, the media missed the forest for the trees. For example, the bigger picture of years of cut-backs at all levels of government to social supports like welfare and housing — supports that once helped keep more women safe and off the street — was ignored by news outlets in favour of more sensational or sentimental coverage of individual failings, in effect “privatizing” what Hugill argues is actually a crisis of public institutions.